Ron Shelton has quite the resume of testosterone-fueled classics he's helmed and/or written, including Bull Durham, Tin Cup and White Men Can't Jump. He's got a gift for capturing a natural way that men actually talk and relate to each other, particularly when competing for women. It's been a full 14 years since we've had a film from him in theaters, a gap that is broken with the arrival of Just Getting Started. 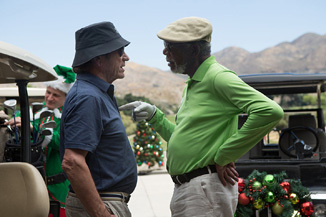 In full “write what you know” mode, the 72-year-old Shelton sets the movie in a retirement community managed by Morgan Freeman, the big man on campus (but who has a big secret). This is shaken up by the arrival of new residents Tommy Lee Jones, an ex-military man, and their romantic interest Rene Russo (...THIS IS NOT OK). In between sniping at and pranking each other, Jones decides to help Freeman survive what turns out to be a mob hit places on him after his cover in witness protection is blown, as well as secure the future of their new residence. Also starring Joe Pantoliano and Glenne Headly (in her last role), the film seems to be a series of “zippy” one-liners and horny old man jokes, or basically The Golden Girls with explosions (and I mean, who hasn't wanted that?). This falls into a category of Grey Panther films that have cropped up of late, as some of the bigger names in cinema have struggled for relevance, to which I would put films like Last Vegas, Going In Style, Grudge Match, Stand Up Guys... look, none of these stand up to 1986's Tough Guys (with Kirk Douglas and Burt Lancaster). This film in particular looks to be a rather limp example of the genre and has both been held back from critics and given little ad support. Appealing basically only to the 50 and over set, this is looking rather forgotten and should slide in with about $6 million this weekend. Expanding to a national release, The Disaster Artist is the story of ... well, it's hard to explain. But there's this guy, Tommy Wiseau, who was bouncing around Hollywood in the early 2000s and claims to be a film director. He's got a... let's say vision, but it's not a particularly coherent or competent one, although he's weirdly confident about his abilities. No one's quite sure where he comes from, where his money is coming from or even how old he is, but hey, he's going to make a movie, right? James Franco stars as Wiseau, the writer and director of The Room, hailed as a new modern classic of ineptitude in cinema, but self-promoted like hell by Wiseau since its filming in 2003. It's become the new must-see midnight film, with people marveling at its general oddness and lack of anything resembling normal human behavior or motivation. Naturally, it's become kind of a cause celebre among new Hollywood. Franco directs himself, with his brother Dave playing the film's co-star and Wiseau's best friend, caught up in his thrall. The cast also includes Seth Rogen, Alison Brie, Josh Hutcherson, Zac Efron, Jason Mantzoukas, basically that whole new Brat Pack (save Jonah Hill), all trying to figure out just what makes this guy tick, Ed Wood style. The thing to wonder about here is whether anyone outside of those really in the know about The Room will have any interest in The Disaster Artist. It must look implausible and incomprehensible outside of that circle. Opening on 19 screens last weekend, it earned $1.2 million and expands to about 800 this weekend, though that super high screen average is no doubt influenced by LA audiences being quite familiar with this story and the film behind the film. With this expansion, it should be able to work itself up to around $7 million this weekend. Pixar's Coco should thus have a third weekend at the top of the box office, having earned about $115 million domestically so far. It's a bit underwhelming compared to other Pixar results, though it does seem assured to get past Cars 3 from earlier this year, especially if it can make it another two weekends to the Christmas bonanza. One can't shake the notion that the foreign culture elements of the film are hurting the bottom line given the strong reviews, when most Pixar films earn well into the $200 millions if they're even slightly good. Although the international money is good (it's already the highest grossing animated film in Mexican history), two domestic whiffs in a row and three out of the last four must leave Pixar anxious for The Incredibles 2 to arrive. For this weekend, Coco should manage about $19 million this weekend. When is a $200 million earning film a disappointment? When it cost over $300 million to make. Justice League is sitting at about that mark after three weekends, one of which was a holiday one. While its international totals make up for that to a slight amount, this is DC's big team-up movie that will shoot below its stand alone Wonder Woman movie from earlier this year, showing amazing waste of potential. It should fall to about $8 million this frame, and may largely be out of the picture by Christmas, missing out on $50 million or more that could have been up for the taking. Wonder is proving to be the leggy, inspirational hit of the fall, having taken in nearly $100 million for its story about a boy with a facial deformity trying to enter back into public school. The starpower from Julia Roberts and Owen Wilson can't be hurting either, and it should add in about $8 million for its third weekend. Thor: Ragnarok continues the strong Marvel run, in deep contrast to DC's grim results of late, crossing the $300 million mark, on its way to $350-375 million – depending on how Christmas goes for it. The lesson here: be fun. Give it $6 million this weekend.